Built in 1791, Lightwoods Park & House is a Grade II listed building and was once a very popular local recreational area. Located in Bearwood, West Midlands, the condition of the park land and the house had deteriorated significantly and slipped into a very poor state of repair. With help of £5.2m of Heritage Lottery Fund (HLF) and Big Lottery (BIG) funding, the park is being restored back to its former glory and will be capable of hosting high quality public and private events. Managed by Sandwell Metropolitan Borough Council, a feature of the park is the garden, opened in 1903, which contains specimens of the plants mentioned by Shakespeare, and a 19th century bandstand. 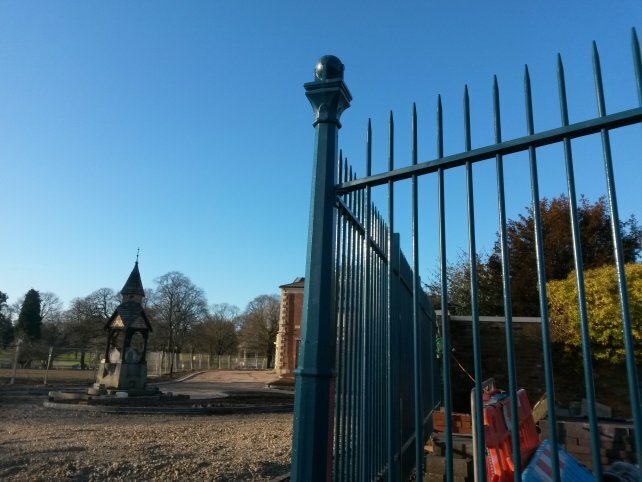 Contracted by Heritage Building & Conservation, Alpha Rail was asked to supply and install bespoke vertical bar metal railings and gates to a variety of locations within the Lightwoods Park & House grounds. In total over 180 metres of metal vertical bar railings of various heights were supplied and installed of which 123m were rooted into concrete foundations. The remaining 60m were diamond drilled into coping stones mounted on top of a retaining wall. Some of the railings featured a backstay support to provide additional stability. All of the metal railings were supplied galvanised and thereafter painted on site in order to ensure the finished look was in keeping with other garden furniture in the park. "It was a pleasure to work alongside Alpha Rail, they provided a very professional service. Everyone we dealt with was deeply knowledgeable and I would have no hesitation in recommending Alpha Rail for any future projects we may have requiring bespoke metal railings and gates.